A rare find in northwestern Turkey has turned up special bronze athletes' tools that date back some 2,000 years. 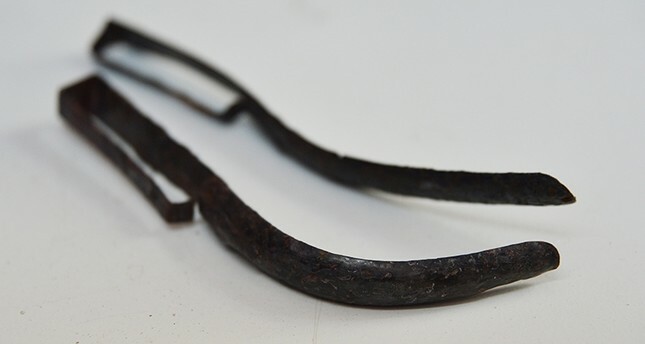 The crescent-shaped tools, called strigils, found in the ancient city of Assos, were used by ancient athletes to clean themselves of a kind of Hellenistic sunscreen, Nurettin Arslan, a member of the excavation team, told Anadolu Agency. "There were no sunscreens like today, so they protected their skin from the sun using olive oil," explained Arslan, who heads the Archeology Department at 18 Mart University in Çanakkale. "After sports, they had to find a way to clean the olive oil from their bodies. Since there was no soap or other cleansing agents they sifted fine grains of sand on their bodies and removed the sand, which absorbed the oil, from their bodies using the strigils." The excavations have been very fruitful, and included graveyards, he said. The presence of strigils in a grave show that that person was an athlete. The city's excavation is being done with financial support from the Culture and Tourism Ministry, with Turkish heavy industries firm IÇDAŞ as the main sponsor.